"*&%$! I forgot that I said I'd bring dessert!" Seven-year-old Loretta has taken it upon herself to be the Bad Word Police. She thinks "crap" is a bad word, so I guess it could be worse. My friend Emily says she swears more when she's excited. She's excited about her new role at work (which happens to be a church) and finds herself swearing about it all the time. Hilarious. I guess that's true with me, too--the Bad Word Police can issue tickets when excitement or frustration ensues. Abby,who's here every Monday night for our big family dinner, says she can't get a word in edgewise around here. Even the most inconsquencial subjects are blown up into an excitable mess. Loretta, of course, lives for this. Many citations to issue. But if I've forgotten about bringing dessert, that's an easy fix. Molly Wizenberg saves the day again. 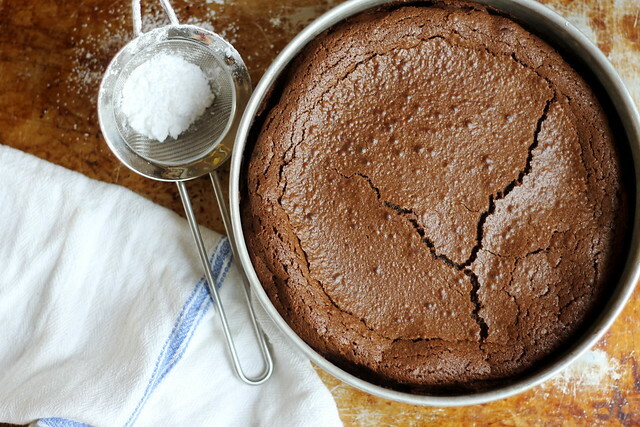 Easy, quick, chocolately depths. Add a little bit of lightly sweetned whipped cream or some strawberries. Or some reduced balsamic syrup and a sprinkiling of flaked salt. Or just plain. The expletives will diminish. Actually, scratch that. They will just be uttered in a more contented way.